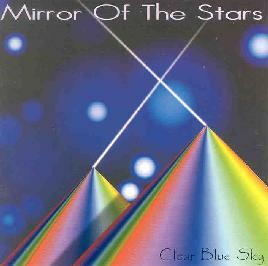 Clear Blue Sky - "Mirror Of The Stars"
Originally formed in the late 60's, Clear Blue Sky released some albums on the Vertigo label in the 70's. Reading the bio on their web site it seems that the band had quite an interesting history, having shared bills with some of the big heavy rock and psych bands of the early 70's. Signed to Vertigo in 1970, the first Clear Blue Sky album sported a Roger Dean cover, an indication of the bands progressive leanings. Fast forward to the 90's and they appear to have been fairly active for the past decade (read the full bio on their web site). The band consists of John Simms on guitars and vocals, Ted Landon on bass, Ken White on drums, and Maxine Marten on backing vocals and percussion. The music on Mirror Of The Stars is a blend of hard rock, psych-rock, Blues-rock, and heavy progressive rock. Simms guitar work and vocals are at forefront, with the guitar being gorgeously tasteful and fiery. Definitely an expressive style and even when he's ripping up the fretboard it's far more elegant and communicative than mere flash. Really beautiful solos. And the man ROCKS! Many of the songs have a standard rock structure and feel, though the keyboards and guitar often kick the music into progressive or psychedelic rock realms. A cosmic tone pervades throughout as most of lyrics focus on matters well beyond the Earth's atmosphere, and are often accompanied by a spacey edge to the music. Among the standout tracks is the title track which features very nice psych-rock guitar. I really dig Simms combination of mind-bending wah guitar and tasty Bluesy rock soloing. "The Passage Of Time" is somewhat more standard rock but the electronics give the music a spacey edge and there's some all too brief but very cool ripping guitar in the songs last moments. In fact, there's a pattern throughout the album where the band will seem to be performing at their most mainstream, yet the songs will be saved by some amazing and varied guitar work. Two of my favorite tracks are "The Eye Of The Cosmos" and "Timelords Speak". The former is a heavy rock tune with a spacey edge, excellent guitar, and cosmic lyrics. And "Timelords Speak" is the heaviest rockin song of the set. It's got a nice spacey edge and Simms' guitar soars into space-fusion heaven. In summary, Clear Blue Sky are a tight band with lots of chops and solid compositional skills. The band have a cohesive sound, yet Simms guitar ventures into a variety of stylistic territory without sacrificing that cohesion. Excellent songs and an impressive guitar talent. I'll have to explore Clear Blue Sky's earlier work. Aftermath is part of the Hi-Note Music group. You can visit their web site at: http://www.hinotemusic.com. Visit the Clear Blue Sky web site at: http://www.clearbluesky.co.uk.